Ready for a toy to make you feel old? The figure that this retro update is referencing is one we reviewed when it was new - 10 years ago this January. Shipwreck can splice a cable, plot a gunnery solution, navigate through shallow waters and keep the helm on a steady heading through the eye of a storm in twenty foot seas while eating a runny fried-egg sandwich with mayonnaise on it. A knowledgeable chief with hands-on experience in most naval vessels up to frigate class, he is a strong hand-to-hand fighter as well, and can be counted on putting the enemy out of commission and take names when boarding hostile ships. 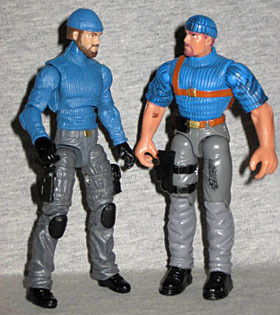 It is quite telling that none of the other GI Joe team ever calls Shipwreck "swabbie" or "sailor-boy." It's just not worth the risk! Gung-Ho has been heard to remark that Shipwreck is the last guy he would want to get into a knife-fight with. This is not to say that he isn't a likeable and sociable individual. On the contrary, he is always the first at the mike on karaoke night, and can perform a number of amusing tricks with his tattoos. That's the filecard from 2002's Shipwreck vs. BAT set - these dollar store figures don't have any kind of biographical information on them. This design would probably be just as forgotten as the wetsuit he wore in the '90s or the grey camouflage from 2004, if not for one thing: Devil's Due Productions. They utilized Shipwreck heavily in their stories, and they used this outfit for him when they did. 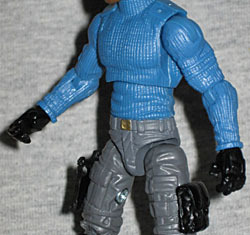 In order to capture the look of Ship's cable-knit sweater and plain pants, he's built from the awesome PoC Snake-Eyes body with Renegades Duke's legs. That means he has long sleeves and gloves, rather than short sleeves and bare hands, but at least that means he's not missing any tattoos like the 2002 version was. What he is missing is a holster or other kind of harness around his shoulders. It would break up the design a little, keeping his torso from being solid blue. The head comes from Rise of Cobra Shipwreck, appropriately - we said in the review that head would be a good source for a DDP Shipwreck, and clearly we were right. The paint on this "budget" figure is better than it was on the big movie tie-in toy: the apps are thinner and less gloppy, which means the details on the face remain crisp. Sadly, Shipwreck does not come with his parrot, Polly. 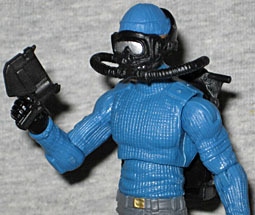 He does come with the fancy scuba tank and the mask that the movie figure came with. The backpack doesn't have any paint apps, but that just makes it look more stealthy. And while the mask is no longer molded from clear plastic, there's a silver app on the goggles to let us know that Shipwreck isn't blind inside there. 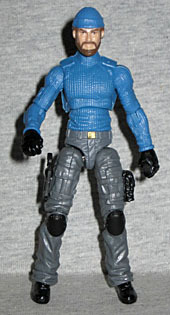 Since he has Duke's legs, he also includes one of the Renegades pistols, one of the ones with a tab to plug into the slot on his outer thigh. When these Market Six figures were first announced, a lot of fans didn't believe they were really bound for the dollar stores - after all, the sculpts and articulation are as good as the mass market toys, rather than being new, stripped-down tools like the junky Marvel toys they sell now (or like the Retaliation vehicle drivers). According to chatter we heard recently, however, these figures weren't supposed to be this good: apparently the plan was to do low-rent versions; but somebody went off-script and refused to make these crappy. Who says Hasbro doesn't care about their fans? Dollar General Shipwreck works well as either a Real American Hero or Resolute version of the character, so while he may not be as flashy as Snake-Eyes or Storm Shadow, he's still worth getting.